This week's tablehopper: I'm seeing Stars. 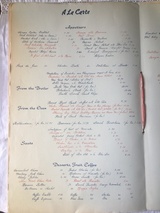 And this is just the first page of a vintage Blue Fox menu! Photo: © tablehopper.com. Today is a really exciting day for me—I have dreamed of being able to host a vintage dinner in homage to the Blue Fox restaurant for years! And today, tickets go on sale for what is going to be a spectacular, only-in-San Francisco dinner that we are hosting in the private Owl ‘n Turtle room at Alfred’s steakhouse (formerly the Blue Fox location!). We will be enjoying cocktails courtesy of Anchor Distilling Co. and reserve wine pairings from Robert Mondavi Winery over a five-course dinner featuring vintage recipes and dishes I have tracked down. Plus, we’ll have live piano entertainment on the white baby grand! It will be a time for cocktail attire, sharing stories and memories, and some gorgeous filet mignon. I really look forward to it, see you there! It’s a buzzy week in San Francisco, with chef Jeremiah Tower in town for a variety of screenings and events to celebrate the release of Jeremiah Tower: The Last Magnificent. I’m looking forward to interviewing him and director Lydia Tenaglia on Thursday (and hosting them at a private industry screening that night!). Once the whirlwind of this week slows down for a second, it will be great to head up to Wine Country this Saturday April 29th for the kickoff of Long Meadow Ranch’s guest chef live fire series, which is bringing the wickedly talented Zak Pelaccio (Fatty Crab, Fish & Game in Hudson, NY) into town. We’ll be enjoying grilled young favas, oysters, spot prawns, whole smoked pig, and plenty of rosé. There’s quite the lineup of talent this summer, including Jenn Louis, check it out (the series runs through September). Okay gang, I’ll see you out and about. Cheers! 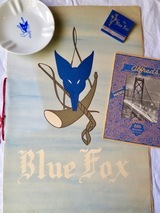 Get Your Ticket for the tablehopper Vintage Blue Fox Dinner at Alfred's on Friday May 12th! There’s a reason Alfred’s is beloved for their steaks—they do it right (and have been doing so for almost 80 years!). Photo courtesy of Alfred’s. The Owl ‘n Turtle room at Alfred’s. Photo via Facebook. Many of you know how obsessed I am with vintage San Francisco restaurant ephemera—I have a rather extensive collection of vintage menus, postcards, restaurant guides, and books, which I have started sharing on Instagram with the #tablehoppervintageseries hashtag. And my collection of tablehopper T-shirts highlight vintage SF restaurant and bar designs. Many of you know that the location where Alfred’s is now, on Merchant and Kearny, was formerly the home of the Blue Fox! Alfred’s was originally on Vallejo Street (when it opened in 1928! ), and then Broadway, and moved into the current location in 1997. Alfred’s has also held a special place in San Francisco diner hearts, from the recent Petri family years to now, with the respectfully updated version under the Daniel Patterson Group. On Friday May 12th, I am hosting a dinner I have wanted to host for a long time. It will be an homage to both the Blue Fox and Alfred’s, to times gone by, and to San Francisco and Northern California history. We are partnering with Anchor Distilling Co. and Robert Mondavi Winery this evening, so there will also be a dash of Italian American heritage in this meal as well. We will be celebrating in the Owl ‘n Turtle private dining room downstairs, complete with a white baby grand piano that Frank Sinatra reputedly played on. We’re going to enjoy listening to Eric Shifrin playing standards throughout the evening, from Hoagy Carmichael to classic songs Frank would have sung. You may recognize Eric from playing at the Fairmont! Our wine partner for the evening is one of the greats: Robert Mondavi Winery. I was determined to partner with a storied Napa Valley producer for this event, someone you would have seen on the Blue Fox’s and Alfred’s wine lists, and am beyond thrilled we will be pairing wines from this legendary winery and pioneer. A winemaker or veteran wine educator from the property will join the dinner to share the deep Robert Mondavi Winery history and speak to the wines. Please note we will be finalizing the vintages and selections in coming days. Expect something very special, especially with the cabernet selection. This is not a night you’ll want to miss. It’s going to be a very only-in-San Francisco kind of night. Cocktail attire…start planning your swank vintage outfit now! When booking your reservation, please specify any guests you want to be seated with. We are going to have 5 tables of 10. I also want to note that, as many of you may know, Alfred’s suffered an unfortunate basement fire a couple of weeks ago. They assure me they are going to be reopening within a week—they’re just cleaning up the smoke damage and fixing the electrical issues—and definitely in time for our dinner. See you May 12th! New A16 executive chef Nicolette Manescalchi. Photo: Di Desmond. Congratulations to chef Nicolette Manescalchi, who has been with the ~A16~ group for eight years, most recently as chef de cuisine at A16 in San Francisco; she is now going to be executive chef of the group. A16 executive chef Rocky Maselli, who opened ~A16 ROCKRIDGE~, is going to be moving back to Eugene, Oregon, at the end of May. He will be taking over the reins at Marché for chef-owner (and mother-in-law) Stephanie Pearl Kimmel, who is retiring. Over the next month, he is helping the A16 team with the transition. Manescalchi was raised baking with her mother and cooking traditional Sicilian food with her father and moved to San Francisco almost eight years ago from Minnesota to work at A16. Not only does she have an English degree from the University of Minnesota, but she also has her culinary degree from the Art Institutes International Minnesota and her sommelier certificate from the International Sommelier Guild. She was so dedicated to learning about Southern Italian food that she even spent her honeymoon in Southern Italy to immerse herself more deeply in the cuisine. She was executive sous chef at A16 Rockridge and helped open it, and one year later took the executive chef position at Le Marais Bakery and opened Le Marais Bistro. She returned to A16 San Francisco as chef de cuisine and is now taking this next step. Also at A16 Rockridge, they are going to be remodeling the private dining room in a couple of months. And here’s a fun thing: A16 is going to have a mobile pizza truck! You may have enjoyed their live fire pizzas at Off the Grid Fort Mason and other events, but now they’re going to have a better oven transport, soon. Will keep you posted. Fried chicken served in a skillet with pickles at Hazel Southern Bar & Kitchen. Photo courtesy of Hazel. Whiskeys and TV screens. Photo via Facebook. 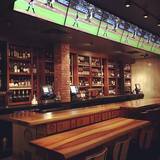 Opening at the end of the week is ~HAZEL SOUTHERN BAR &AMP; KITCHEN~ in the former Cadence in Mid-Market. Gone are the elephant tusks, and it’s more like a rec room with cookin’ from your friend’s awesome mom. Owner Jamie Boatner and executive chef Casey Hatwig are pulling Southern recipes from Boatner’s mother’s recipe book, like collard green dumplings (Hazel’s collard greens, cream cheese, served with a spicy peach chutney) and Hazel’s fried chicken, served in a skillet or with waffles. The menu has casual fare, like po’boys and tater tot nachos with pimento cheese sauce, fried okra, tomatoes, pickled jalapeños, green onions, and sour cream, plus larger plates like shrimp and grits and sides. As for the rec room side of things, there are two pool tables, 16 TVs, and a retro ’70s vibe from designer Craige Walters, plus private dining rooms and corporate event options. You’ll find quite the whiskey selection (more than 170 bottlings) and a refreshingly affordable cocktail list ($9-$11), including some classics like a Sazerac and new drinks like a ginger-pineapple mint julep. Hours are kitchen daily 5pm-1am, bar until 2am. Grand opening is Friday April 28th. 1446 Market St. at Fell, 415-851-8562. 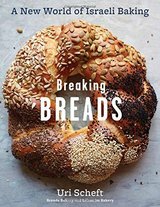 Coming up this Friday April 28th is a special event, Hallah & Spice Pop-Up Shop, featuring visiting Israeli baker Uri Scheft (of Breads Bakery in New York and the newly released book Breaking Breads: A New World of Israeli Baking) and La Boîte’s spice whisperer Lior Lev Sercarz (La Boîte spice shop, The Spice Companion). ~THE PERENNIAL~ is hosting the duo in conjunction with the Jewish Community Center. The pop-up will feature hallah-braiding and spice-blending demos with Uri and Lior; noshes, coffee, and cocktails featuring La Boîte spices for sale from The Perennial; a pop-up shop from La Boîte spices; and signed books for sale from Omnivore Books—the first 40 Breaking Breads book purchases include a fresh hallah, baked just for you by Uri (trust me, you want this!) and the first 40 The Spice Companion purchases include a special spice blend, blended just for you by Lior! 11am-1:30pm. This is a free event! 59 9th St. at Mission. This Sunday April 30th is the annual Wok on the Wild Side fundraiser for City College of San Francisco’s Culinary Arts and Hospitality Studies Department. There will be plenty of dishes and wines to try, live and silent auctions with proceeds benefiting student programs (including a sausage class, a BBQ tasting, SF Giants tickets, and bottles, magnums, and cases of wine and spirits, plus hotel and restaurant certificates), music, and more. Alumni who will join the students in serving dishes include May Seto of Grand Lake Kitchen, Sarah Lau of Nopa, Robert Hurtado of Arguello, Ryan Gozinsky of Authentic Bagels, Kathleen Kwuan of State Bird Provisions, and more. 4pm-7pm. Tickets are $75. City College of San Francisco—Statler Wing, Ocean Campus, 50 Phelan Ave., 415 239-3152. Also on Sunday April 30th is the reopening of the Mission Community Market’s new incarnation, La Placita. Come by from 11am-3pm for a block party, with food, music, and more. Check out the event here. Bartlett St. between 21st St. and 22nd St.
Okonomiyaki in a stone pot at Namu Gaji. Photo: © tablehopper.com. So, it’s a foggy Friday night, and you’re like, damn, some ~NAMU GAJI~ ramen and stone pot would really do me right… Well, lucky you, it’s not too far away, because on Fridays and Saturdays, come by ~BEACHSIDE COFFEE BAR AND KITCHEN~ from 5pm-10pm for Namu Gaji’s temporary pop-up. You can enjoy noodle soups, KFC-style chicken wings, smoked brisket with roasted kimchi and cultured butter, okonomiyaki, smoked pork donburi, and more. 4300 Judah St. at 48th Ave. If you enjoy the wines at ~RESOLUTE~, you’ll be happy to know you can now pair a little more with those glasses of wine you’re chugging, like tarte flambée (Alsatian pizza) with toppings, either a classic (crème fraîche, fromage blanc, mozzarella, bacon, sweet onions, and chives) or artichoke (Fontina cheese, marinated artichoke hearts, and asparagus), plus panini (caprese or grilled cheese with sharp cheddar, Brie, shallots, arugula, and vermouth)—both served with a side salad, and there’s an arugula salad too. 678 Geary St. at Leavenworth. Jeremiah Tower: The Last Magnificent explores the remarkable life of Jeremiah Tower, one of the most controversial and influential figures in the history of American gastronomy. Tower began his career at the renowned Chez Panisse in Berkeley in 1972, becoming a pioneering figure in the emerging California cuisine movement. After leaving Chez Panisse, due in part to a famously contentious relationship with founder Alice Waters, Tower went on to launch his own legendary Stars Restaurant in San Francisco. Featuring interviews by Mario Batali, Anthony Bourdain, Ruth Reichl, and Martha Stewart, this delicious documentary tells the story of the rise and fall of America’s first celebrity chef, whose brash personality and culinary genius has made him a living legend. Want to learn more about what’s in your glass? Good idea. Here are a few opportunities coming up, starting with The School of Booze from Anchor Distilling Company on Sunday May 7th. This day class will be at The City Club, and your ticket includes four Educational Drinking seminars to learn more about what’s in the glass, and some snacks too. You’ll get to attend Gin: A Historical & Stylistic Perspective, with Anchor Distilling’s Executive Director of Education Alan Kropf; Spirits, Before & After, with award-winning writer and bartender St. John Frizell; The Spirits of History: Woven Through Wormwood, with John Troia, owner of Tempus Fugit Spirits; and Whisk(e)y Exposed, with Andrew Friedman, founder of the Washington State Bartenders’ Guild. 1pm-4pm. Tickets are $60 (or $110 for two, with a free jar of Luxardo cherries). The City Club of San Francisco, 155 Sansome St. at Pine. Thursday May 4th is at the Napa Valley Wine Academy CA (6pm-8pm), with an open house and alumni get-together with sparkling wines and nibbles. Mingle, meet WSET instructors and alumni, and enjoy bubbles and bites. $10 registration fee (includes nibbles and wine tasting). 2501 Oak Street, Napa. Then on Thursday May 11th, come by the Grape Experience Wine & Spirit School (6pm-8pm) for the WSET Open House event, which will present WSET wine, spirits, and sake courses along with a tasting of some great wines using the WSET Systematic Approach to Tasting. Participants will be able to meet instructors, see materials and even sign up for an upcoming course. Book here. Holiday Inn, 1500 Van Ness Ave. at Pine. What Do Tommy Lee and Deadmau5 Have in Common? Honestly, I kind of don’t want to know, beyond the fact they both dined (separately) at ~RAMBLER~ on Sunday night. Both ~Tommy Lee~ and ~Deadmau5~ enjoyed the Rambler Burger with red onion bacon jam, white cheddar, and pickles, accompanied by fries. Tommy drank some M. Chapoutier Rosé, and Deadmau5 kept it booze-free with a Coke. Since its formation in 2001, Bacchus Management Group has served as a restaurant and hospitality management group, creating inspired and successful businesses in the world of food and wine. Founded by industry veterans, Bacchus Management Group oversees and manages the daily operations of several award-winning restaurants throughout the San Francisco Bay Area. In addition to its many full-service restaurants, Bacchus Management Group also includes a private five-acre organic farm located in the hills above Woodside, a wholesale coffee and custom roasting business, a wholesale and retail artisan bakery, and key partnerships with several international winemakers and spirits distillers. Foreign Cinema is a Top 100, popular, fine dining restaurant that is looking for a part-time sommelier to add to our team. We are looking for someone passionate about wine and service who will look for ways to continually raise the bar. Please be dynamic, comfortable selling on the floor, approaching tables, able to think ahead, and resolve issues effectively. Generally be able to think on your feet!